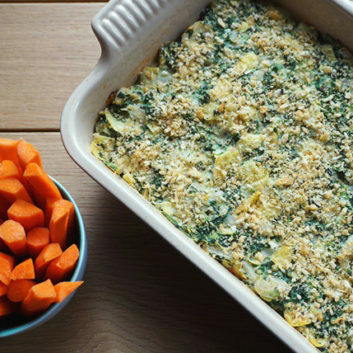 Spinach artichoke dip typically clocks in at 300-plus calories per ¼-cup serving—without considering the chips. My slim-style, dairy-free vegan version provides only 110 calories but is still rich and delicious—and it’s loaded with 7 grams fiber and 7 grams protein. It gets its creamy texture from (surprise!) pureed white beans and silken tofu. Your guests won’t even realize the secret swap…unless you decide to divulge. Heat the oil in a pan and sauté the onion until it gets soft and translucent. Before the onion is finished, add the garlic for the final minute. (If using fresh spinach add to pan and sauté until wilted.) Set aside to cool. In a food processor, combine the white beans, tofu, almond milk, nutritional yeast, salt, and pepper and blend until smooth. Pour into a bowl and add the chopped artichokes, well-drained spinach, chopped water chestnuts, sautéed onion-garlic mixture, (spinach, if you used fresh rather than frozen) and optional red pepper flakes. Stir to combine. Transfer to a baking dish and sprinkle the top with Panko breadcrumbs. Bake for about 12 to 15 minutes until golden brown. Serve with crunchy crudité. **Use dairy-free breadcrumbs for vegan dip.